Locating this little gem is a little difficult. 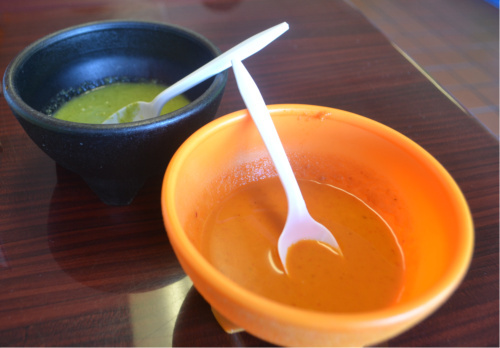 If you are heading towards Westport on Route 1, make a right at the light where Pennzy’s Spice is located and Los Poblanos is one of the five storefronts immediately to your left. Park behind the building and enter from the rear. There are three four-person booths and a couple of tables. 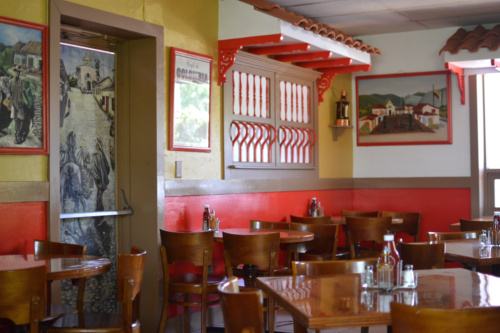 The walls are brightly painted adorned with regional posters and a Spanish language TV offers a little entertainment. 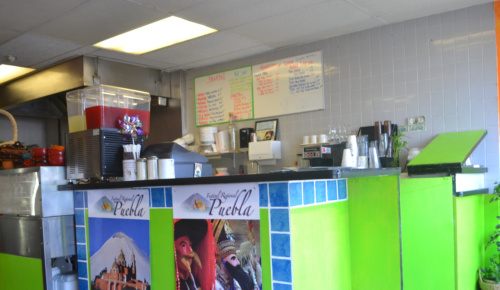 The menu is brightly colored with various Mexican offering. I wanted to sample Los Tacos and ordered four of them. Once delivered the first item I noticed was the amount of filling, Los Poblanos significantly fills the soft tacos. Green (cilantro) and orange (I would guess habanero) sauce accompany the tacos. The cilantro sauce was great and complemented the flavors and the orange was a little too spicy for my palate but had great flavor. I decided to work my way from least to most spicy and started with The Carnitas (pork) taco. The cubed pork was simply sautéed and topped with diced raw onion and cilantro. The flavors were mild, and mine included a few cubes of pork fat. The addition of some on the green cilantro sauce created a great balance of flavor and very mild in heat. The Pollo tonga (shredded chicken) taco was smothered in a red sauce that upon first bite I thought was too mild as well. But the heat of the pepper slowly arrived about 30 seconds later, no a burn, but a mild reminder that this was Latin food. The addition of cilantro again balanced the flavors. 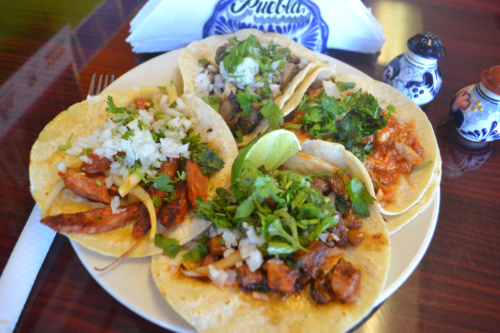 The last taco was the Al pastor (spicy pork). At last I found some spiciness. 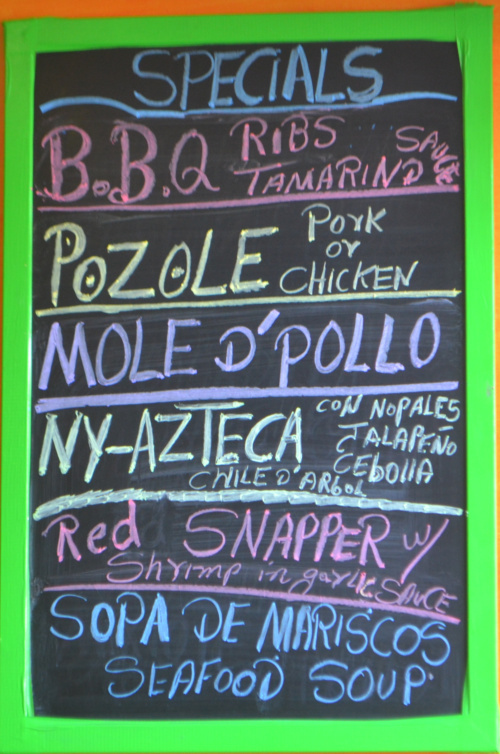 The same pork that I enjoyed in the Carnita was sautéed and then tossed with a spicy red sauce. This created a great depth of flavors with a good level of spiciness. This was my favorite taco of the four. Overall I was impressed with Los Poblanos and look forward to returning and enjoy additional options. I ventured for a quick lunch to see if all of the recommendations I have heard recently were deserved. As I approached this very off the beaten path location, which is more residential than commercial, the first item I noticed was the bright colors of the exterior. Parking is limited for about 10 cars and a little maneuvering is required. Once inside, to the left there is a bakery with a hot salad bar (not self-served) and to the right is a dining area with ten to fifteen tables. Two HDTV oversee the dining area and during my visit they each were broadcasting an international soccer game. 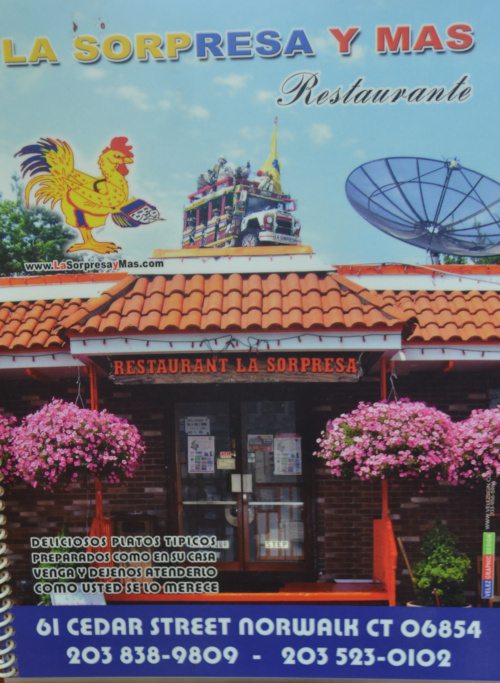 The menu is as colorful as the exterior, full of a variety of Columbian cuisine. 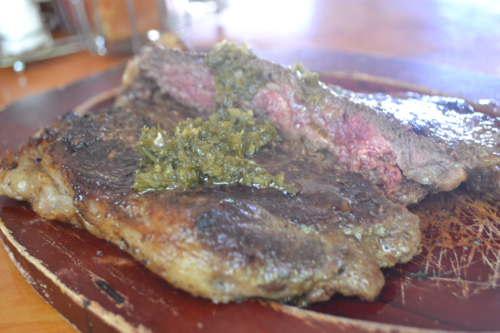 For some reason I was less than adventurous and ordered the Churrasco (medium rare), a grilled steak with Chimichurri sauce. It was served with arroz (rice), tostones (green plantains), frijoles (beans) and ensalada (salad). The server brought a bowl of bean soup instead of the salad. 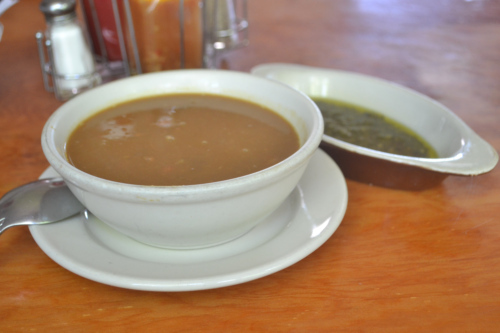 The flavor of the soup was full of smokiness and with loads of al dente beans and pork, the soup was delicious. The steak arrived while I was only halfway through the soup and my initial reaction was not positive. From the outside there was a lot of fat and grizzle and there were several slits through the main section, probably to check for the doneness. After a few bites my initial thoughts were confirmed, this was a fairly weak piece of meat, about 40% grizzle/fat, and it was medium-rare in certain spots and medium-well in others. On a positive note, the Chimichurri was outstanding. The rice and plantains were delivered as I was halfway through the steak. 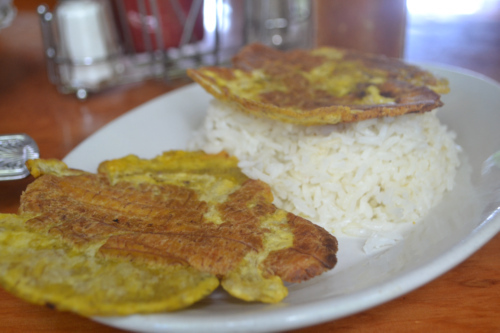 I liked the rice which brought just a bit if sweetness but the plantains were incredibly bland and boring. Overall, I was not overly impressed with the food at La Sorpresa y Mas, the service was friendly but very disjointed. I blame myself a little for not ordering one of the dishes the regulars were enjoying at other tables. It is worth a revisit in the future but I am not rushing back. 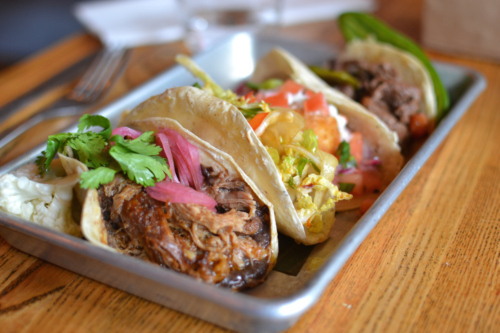 A quick trip to Bodega Taco Bar in Darien was a great choice for lunch. 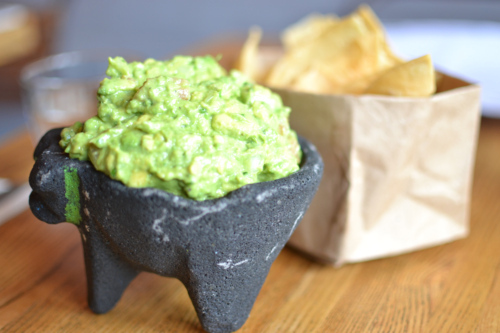 As I waited I ordered the original guacamole that is “Slapped to Order.” It arrived with a basket of house-made tortilla chips. The guacamole was delicious, but a little citrusy for my taste. It was chunky, with a good array of textures from the avocado, tomato, and jalapeños. The chips were more than enough for the portion size. It’s lunch so Tacos were the choice. The question was…how many and which? I decided on four and chose one from each food group. I ordered (1) “Baja” – panko crusted mahi mahi, pico de gallo, lemon aioli, (2) “Cochinita Pibil” – slow cooked pork, refried beans, pickled red onion, cilantro, (3) “Crispy Korean Chicken” – red pepper paste, Asian slaw and (4) “Argentino” – hanger steak asada, charred onion, salsa de chili de arbol, cilantro. In order of my preference. The Baja was my favorite. The crispy fried fish was fantastic, and the toppings made this a perfectly delightful, bright flavored taco. Close behind was the Argentina, in which the flavors were the opposite of the Baja. They were rich and deep and earthy which the cilantro popping the flavors. I had no idea what to expect with the Korean Chicken but the menu should add the word spicy somewhere to give a head’s up. 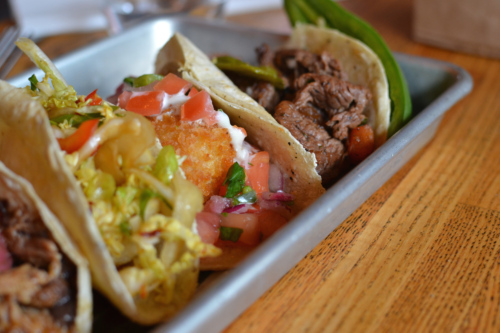 This taco delivered quite a kick to the unaware palate. Once I knew about the heat, bite #2 was more enjoyable, but there was a drop from the first two in my preference. Again, my least favorite was the pork. It may be me as I am probably the only person I know that is not a fan of the pork at Bodega or Valencia. I find it very bland. I should learn to travel down a different path in all of my future visits. 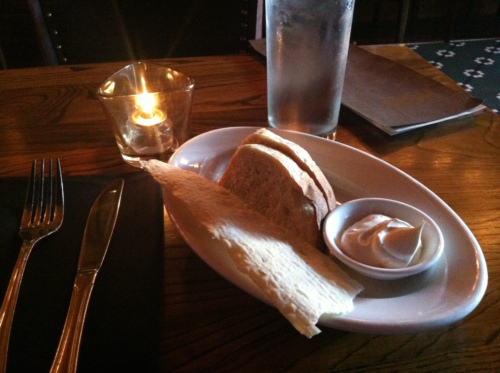 I really like the vibe, the décor, the servers, everything about Bodega. It will definitely make the power rotation. Almost three years ago I visited and wrote that Haute Dish showed good potential; so it was time to return. Again, after my recent meal where I thought one dish was fantastic and the other was an over-thought disappointment, I believe the “good potential” opinion still stands. The interior is speakeasy modern with a large portrait at the entrance welcoming the guests. The long bar extends along the right wall and a long row of banquettes along the left with a separate dining area in the rear. Service was excellent. My server was both knowledgeable and opinionated. As much as I wanted to order the General Tso’s Sweetbreads (as it turns out I ordered the sweetbreads at the previous visit), he kept nudging me to the Mac n’ Cheese, which was a great recommendation. 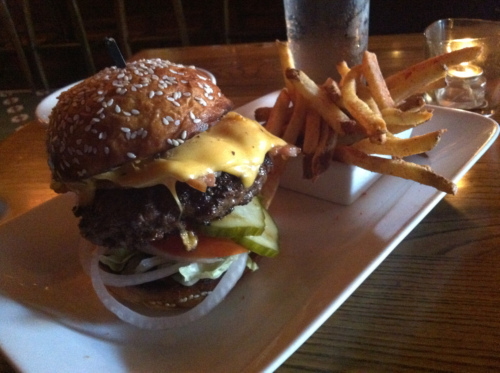 I wish he would have steered me away from the burger, but I was pretty determined to give this burger a try. The “MAC N’ CHEESE” was not your mom’s green box or Velveeta variety. I cannot remember the last time I ordered this comfort food in a restaurant, but I assumed a plated bowl with a heaping mound of steaming pasta, engulfed in sauce and topped with some sprinkled breadcrumbs. What arrived was a nicely plated horizontal interpretation of this classic dish. 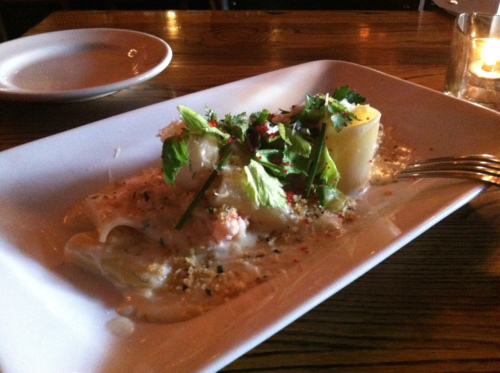 The jumbo rigatoni shaped pasta was perfectly prepared to al dente and topped with King Crab, celery and truffle oil. The incredibly smooth cheese sauce was primarily Taleggio cheese and it was delightful. There were several chunks of sweet crab that were perfectly prepared. The kitchen then added a little unmentioned ingredient, roe. Each time one burst in my mouth it added a great textural sensation. The celery, scallions and bread crumbs added a little zip and crunch. This rendition of MAC N’ CHEESE was delicious…I may need to begin a search for other great offerings. When the “FLAVOR COUNTRY BURGER” arrived all I could do was stare. It looked like a culinary totem pole. Granted the menu states “with everything, no temps or substitutions ever!” but this was layer upon layer of toppings. Included in the tiers were pickles, tomato, cheese, mushrooms, onions, bacon with mayo-horseradish…all served on a buttery brioche bun. Accompanying the burger was a small portion of fries. The meat was delicious (although a little over-salted), the kitchen hand formed the meat to retain the looseness of the grind and the flavor was reminiscent of excellent grass fed meat. Unfortunately the toppings were just too many; they overwhelmed the great meat flavor. Each was delicious in its own right (I especially liked the spicy pickles) but there are times when too much is too much and this was one of those occasions. The brioche bun was one of the best I have ever tasted and was a perfect choice for the meat. The fries were horrible. They were dense, almost hard in texture, not from being over- or undercooked, and the kitchen topped the fries with either a paprika or a different red pepper spice, which I did not like at all. 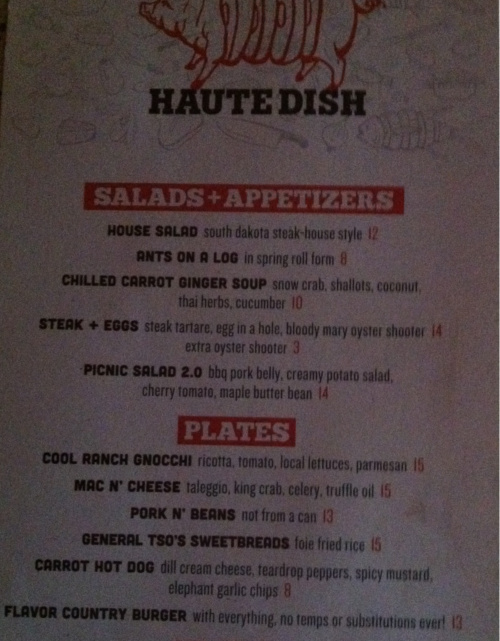 Overall I still believe that Haute Dish has potential but they need to know when to stop. The Mac & Cheese was a beautiful combination of textures and flavors and a brilliant interpretation while the burger was just too much and did not work at all. The fries?…all but a couple went back to the kitchen.